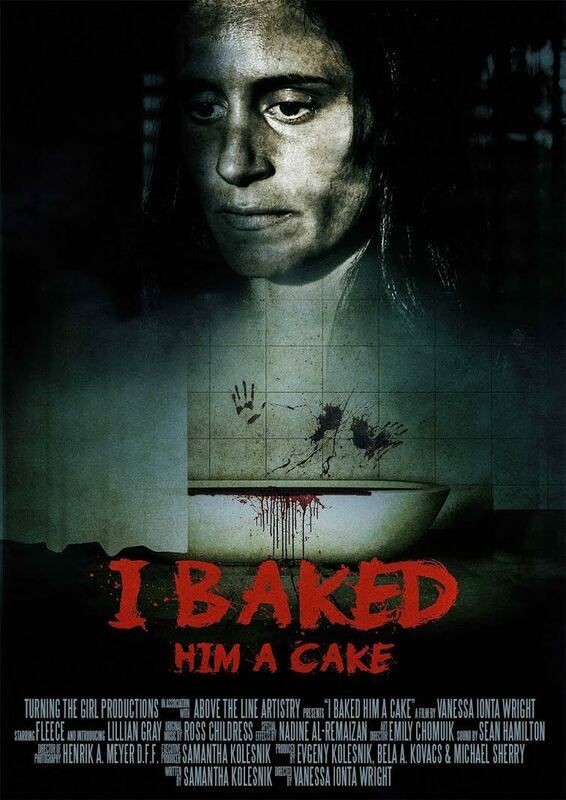 I Baked Him A Cake is a 5-minute horror short directed by Vanessa Ionta Wright and written and produced by Samantha Kolesnik. The film stars Fleece as Mother and Lillian Gray as her daughter, Lenora. The two female stars do an excellent job of being void in all of the best ways. Their performances make us afraid- afraid for them and afraid of them all at the same time. And the best part is we never really understand why. Gray steals the show as Lenora, slowly traversing the horrors around her with a composure that chills to the core. The story is adapted from a short story by Kolesnik, which follows a mother and daughter as they tidy up and prepare for a birthday. In this case, minimalism does everything it should. The film uses tiny yet crucial details to piece together the plot. It requires a few viewings to get all of the minutiae on display. The dialogue, sparse and very open-ended, is done well. Any violence is only hinted at, and the little gore used in this film is meaningful. It is not so much about shocking us with blood, but, rather, shocking us with a young girls’ reaction, or lack thereof. The film has a few feminist nods, and these only serve to further empower the film’s raw emotional intensity. Blood is chocked up to menstruation, mom dons no makeup or elaborate hairstyles, and both girls dress androgynously. All of this not only ups the ante on the gritty realism of the film but also serves as a refreshingly different gaze. Also, the opening is a nod to gender politics in horror. We see a partial face and button-down shirt holding a heavy piece of equipment. Even the most socially conscientious horror movie goer will make some faulty assumptions here, only to be forced to acknowledge these errors shortly thereafter. For such a short film to pull such a thought-provoking little bait and switch is impressive. One of the few criticisms I have repeatedly heard about this film is that it is too ambiguous. Like any short film, time is a real constrictor. Like a breath of fresh air in a current world of backstories galore, the film resists the temptation to over explain things. And it’s a good thing because too much detail would have erased the complexity of the film and stripped the film of its emotional punch. This frees the film to focus on the atmospheric and haunting tone. Cake takes its time to create horror through long and affective shots, never feeling the rush that so many shorts fall victim to. It haunts with the juxtaposition of horrific deeds with mundane, innocent ones. And these types of horror don’t end when the film does. Yes, details are missing, but as the viewer, you have to be willing to think and work, for this one. The filmmakers create an immediate level of trust between themselves and the audience. And these ladies know their audience. They trust us to imagine the best, or worst, when filling in said blanks. Cake bets on careful details and the savvy of the audience. And that bet pays off. Marissa Pona is an English teacher, writer, graduate student, full-time mom and wife, and proud New Jersian. She writes for the Jersey Ghouls podcast and blog. She enjoys all things horror, listening to podcasts, feminist rantings, the shore, and snuggling with her co-hosts.